If you haven't jumped on the cleaning-with-vinegar bandwagon, what are you waiting for? You can clean so many surfaces in your house with this edible, non-toxic ingredient. 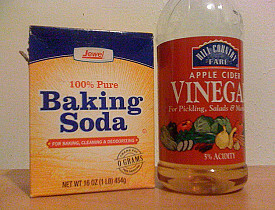 In addition to being an effective cleanser, plain old white vinegar is cheap. Big box stores and club stores often offer deep discounts on this already inexpensive item. You can create a totally green and non-toxic cleaning supply arsenal with just a few items, all of which can be bought in bulk for additional savings and less packaging: A large jug of white vinegar, a large bulk bag of baking soda, ecological dish soap, rags, a natural cellulose sponge, a good scrub brush, and steel wool pads. You can clean virtually anything in your house with those ingredients, and of course, water. In order for you to get a jump start on your green spring cleaning, I've got ten ways to clean the house with vinegar, right here for you. Disinfect the microwave: Mix one cup of water and 1/4 cup of vinegar in a microwavable bowl. Microwave the bowl of vinegar and water on high until it boils, then turn the microwave off. Leave the steaming bowl of vinegar and water in the closed microwave oven for five minutes. Open the microwave, remove the bowl, and wipe down all of the surfaces. The gunk and grease on the walls of the microwave should be easy to remove. Use vinegar as fabric softener: During the rinse cycle, add a cup of white vinegar to your washing machine. I do this all the time to soften laundry, and to help clear up any smells that might remain in the laundry. The smell of vinegar dissipates quickly; your clothes won't smell like vinegar after they dry. Homemade toilet cleaner: Who needs toxic bathroom cleaners when there's vinegar in the house? Squirt a ring of ecological dish soap under the rim of the toilet bowl. Then spray it with vinegar, and scrub with the toilet brush. It cleans like a charm, and your bathroom will smell like salad dressing for a while. The result of this is that when you eat salad with vinaigrette dressing, you might think of the bathroom. The effect of this smell association has yet to be studied by psychologists. Shower and tub cleaner: Mix vinegar and dish soap in one of those reservoir-handled scrub pads. It makes for convenient daily shower or tub cleaning. DIY scrubbing cleanser: You can make your own slightly gritty soft-scrubbing cleanser. Mix a paste of 1/4 cup baking soda, 1 TBS ecological dish detergent, and enough white vinegar to moisten the whole thing. A word of advice: After you scrub with this mixture, wipe it off with a rag, then spray the surface with water and wipe again. Otherwise, you could end up with a film on the surface. Remove lime scale from a shower head: Lose lime scale from your shower head with this one easy trick. Put some vinegar in a plastic bag, then cover the shower head with the plastic bag. Leave it for a couple hours, then remove the bag. I have seen this method recommended by everyone from professional plumbers to DIY bloggers. Clean Jacuzzi tub jets: Oh, hey, Jacuzzi owner! Are the jets in your tub diggety-dirty? Soak the whole tub in a vinegar and water mixture, and then run the jets for 5 minutes. Drain the tub. Scrub tile grout with vinegar: Work a paste of vinegar and baking soda in circles with a stiff nylon-bristled brush. The poultice of vinegar and baking soda is recommended by Denver tile contractor KMS Woodworks. Clean small kitchen appliances: If you don't want to get toxic cleaning solutions near your food prep appliances, a vinegar and water solution in a spray bottle is an edible alternative. Eco-hack a wet mop: You know those mops that spray a chemical solution, and then you mop up the chemical solution with a disposable mop pad? So you can eco-hack those. Instead of disposable pads, you can use rags. And you can fill the cleaning solution jug with vinegar. Do you have great tips for cleaning with vinegar? Share them! How Much do Cleaners Charge for Flood Cleanup?